Dry & Steam Carpet & Rug Cleaning Services Mossley Hill L18 | Quality Property Care Ltd. If your domestic or commercial carpets and rugs and carpets require qualified refreshment, you are on the right place! The hard-working and deligent professional carpet cleaners will make them softer, brighter and more hygienic than ever. Give our carpet cleaning client support associates a call on 0151 673 0008! They will fix deep carpet cleaning service whenever possible for you! Steam carpet cleaning: hot water extraction technique with deep action. The method is ideal for old carpets and synthetic. Dry carpet cleaning is a dry foam carpet cleaning treatment that uses no liquids and prevents delicate carpets from tearing and wasting. Quality Property Care Ltd. offers deep carpet cleaning to remove all residue, stains, dirt and allergens and to eliminate all the germs in your carpets and rugs. The professional carpet and rug cleaning is done by: hoovering, followed by highly efficient hot water extraction and stream carpet cleaning which takes away all excess water from the rug or carpet. For valuable rugs or rugs which can not be cleaned with water, the firm offers dry foam cleaning and rug cleaning to safely eliminate the dirt and restore the beauty of your rugs. The expert services offered are ideal for commercial and domestic properties too. The most effective deep cleaning for rugs and carpets is the wet deep carpet cleaning or the hot water extraction carpet cleaning from Quality Property Care Ltd.. 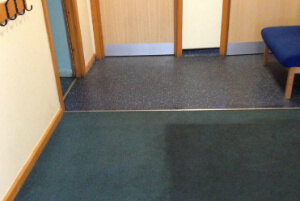 It includes pre-treatment of the carpet by hoovering with professional vacuum cleaners, and then carpet stain and spot removal, followed by the steam carpet cleaning. The trained cleaners do a top quality shampoo carpet cleaning, using certified and safe cleaning solutions, which will not harm you, your children or your house animals. The carpet or rug will have as much of the water removed from it, so it will require only 2 hours to completely dry off. If you request it, the cleaners can perform a very nice deodorising of your rugs and carpets for an added clean and fresh effect. There are some rugs and carpets which cannot safely be cleaned with water, so the cleaners will provide a safe and very efficient dry foam carpet cleaning. The special and perfectly safe foam is sprayed and rubbed into the rug or carpet, and after it has done its cleaning work, it is extracted with the suitable tools and vacuum cleaners. The same can be done with your curtains, mattresses or draperies and blinds. Dry carpet cleaning requires no drying time, so you can step on your rug or carpet immediately after the cleaners are done. The firm regularly invests a lot of assets into purchasing the latest, safest and most efficient carpet cleaning technological innovation. The cleaners are also regularly being trained to safely and properly use them, and to cope with a variety of spots and materials. Don`t hesitate to book our reasonable carpet cleaning company Mossley Hill L18 today! Quality Property Care Ltd. is available for your requests! Do not wait to book any of our specially customized carpet cleaning services in Mossley Hill L18 right now! Use the direct online booking form for reservations. Obtain a free quote immediately on 0151 673 0008!